Hey, everyone! I made this card for a few different challenges this week. The sketch if from Card Patterns sketch #59. The colors are from StampTVs color challenge for the week: use red, yellow and royal blue! Nice and cheery colors, don't you think? :) And lastly, Stampin' Sisters in Christ had a challenge to make a card about peace or prayer this week. 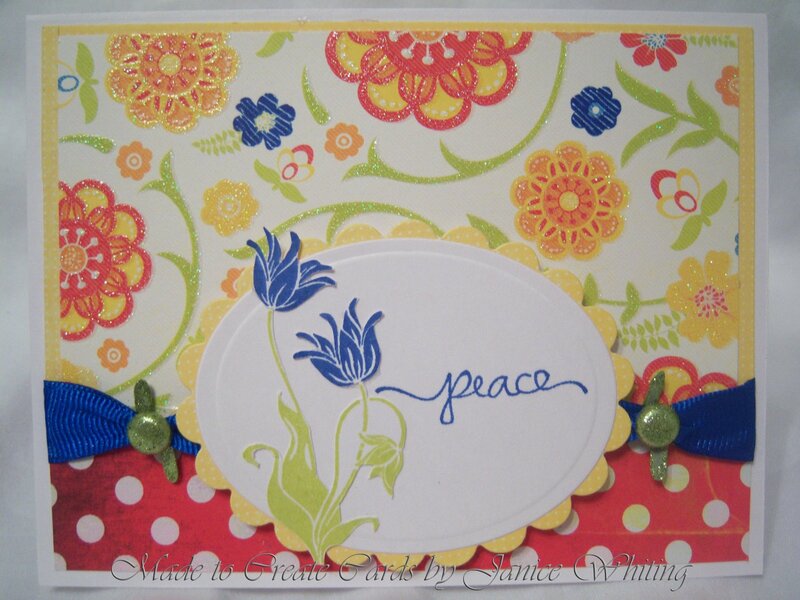 I have Nina Brackett's Vintage Borders stamp set and in it there is this wonderful "peace" sentiment stamp that I used as my sentiment. This is so pretty! I love that floral pattern paired with polka dots. Oh my, when you open the page you just see this BURST of color that is so cheery and happy! Lovely creation! Thanks for participating along with the Stampin' Sisters in Christ challenge this week! I love how you color blocked the flower. Beautifully done. Thanks done sharing with us at SSCC.